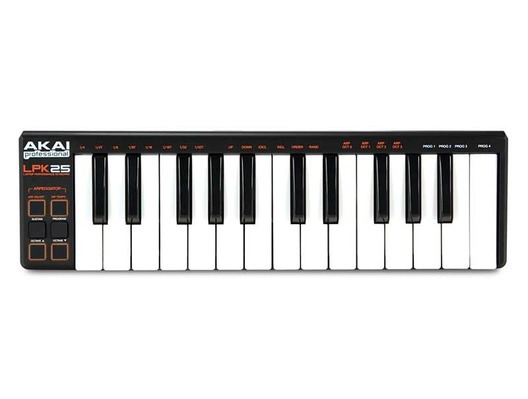 Akai LPK25 Laptop Performance Keyboard MIDI Controller is a USB MIDI controller for musicians, producers, DJs and other music creators. Measuring less than 13" across, and weighing less than one pound, the LPK25 is perfect for the musician on the move and will fit easily into a laptop case or courier bag for ease of portability. The Akai LPK 25 Laptop Performance Keyboard is less than 13 inches across and weighs less than one pound to easily fit into a laptop case or backpack for extreme portability. Here we have the Akai LPK25 in brand new condition and in B-Stock. The B-Stock versions would have been on display at a training evening or trade exhibition only and will come boxed 'as new' with all accessories and a 1-year warranty.